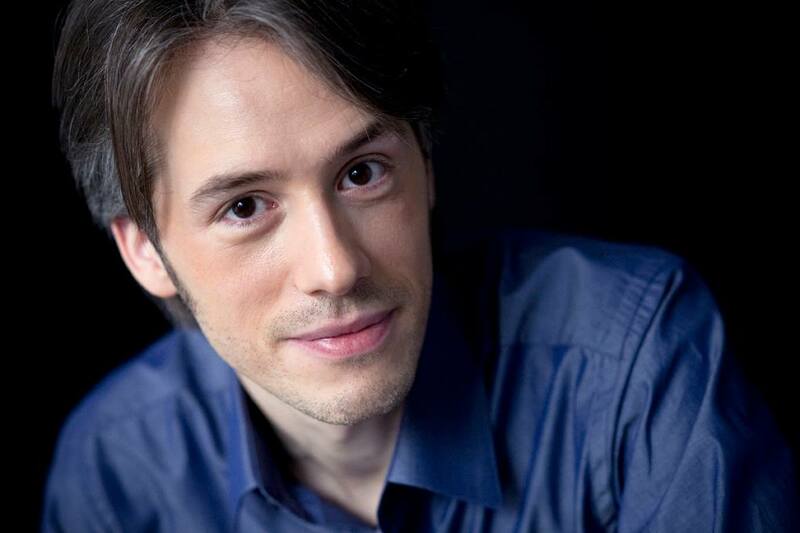 The German-Brazilian violinist Nicolas Koeckert, who comes from a traditional musical family, was born in Munich, Germany. At the age of 5 he received as a gift his first violin from his grandfather. 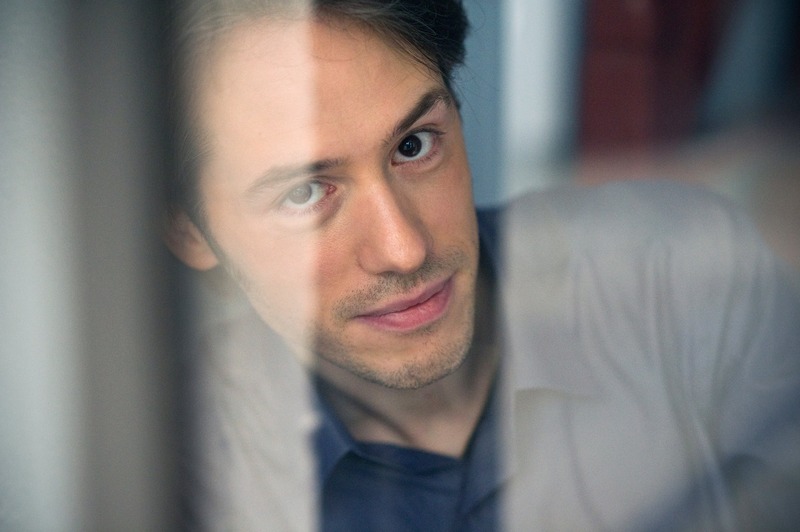 Nicolas started his academic studies when he was 16 at the Hochschule für Musik Würzburg with Grigori Zhislin. Continuing his studies with Zakhar Bron at the Hochschule für Musik Köln from 1998, Nicolas started to perform regularly as an international soloist. In 2005 he graduated with highest distinctions and two years later finished his Master’s degree. In 2001, he won the first prize at the ‘International Competition for Young Violinists Novosibirsk’ in Russia, where he also received the special prize for the best performance of the commissioned composition and the ‘Cultural Prize of Novosibirsk’. 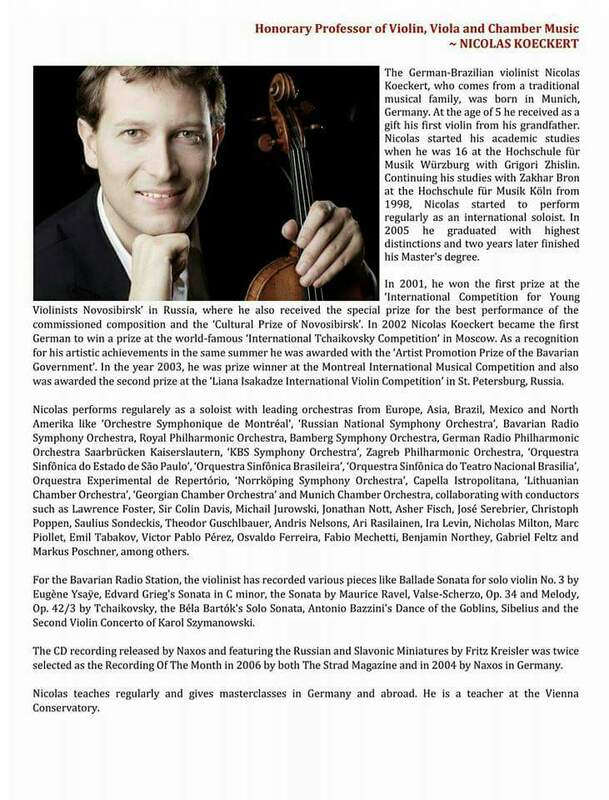 In 2002 Nicolas Koeckert became the first German to win a prize at the world-famous ‘International Tchaikovsky Competition’ in Moscow. As a recognition for his artistic achievements in the same summer he was awarded with the ‘Artist Promotion Prize of the Bavarian Government’. 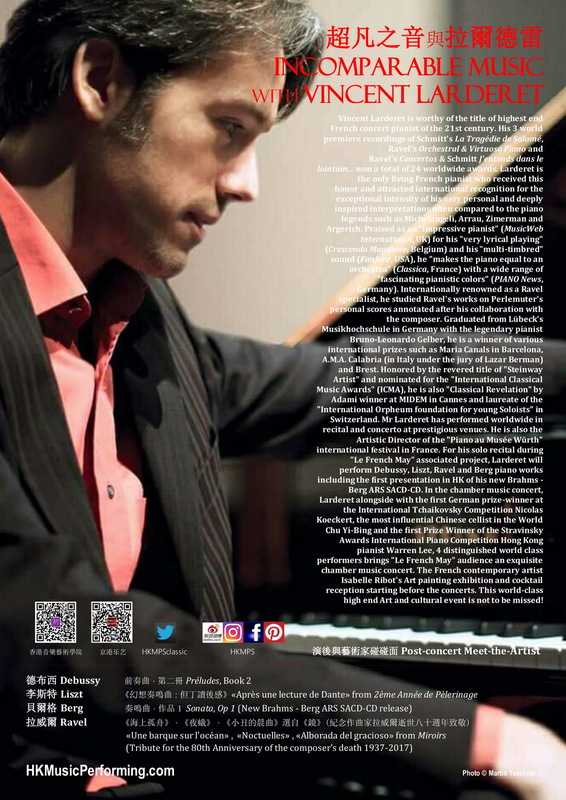 In the year 2003, he was prize winner at the Montreal International Musical Competition and also was awarded the second prize at the ‘Liana Isakadze International Violin Competition’ in St. Petersburg, Russia. Nicolas performs regularely as a soloist with leading orchestras from Europe, Asia, Brazil, Mexico and North Amerika like ‘Orchestre Symphonique de Montréal’, ‘Russian National Symphony Orchestra’, Bavarian Radio Symphony Orchestra, Royal Philharmonic Orchestra, Bamberg Symphony Orchestra, German Radio Philharmonic Orchestra Saarbrücken Kaiserslautern, ‘KBS Symphony Orchestra’, Zagreb Philharmonic Orchestra, ‘Orquestra Sinfônica do Estado de São Paulo’, ‘Orquestra Sinfônica Brasileira’, ‘Orquestra Sinfônica do Teatro Nacional Brasilia’, Orquestra Experimental de Repertório, ‘Norrköping Symphony Orchestra’, Capella Istropolitana, ‘Lithuanian Chamber Orchestra’, ‘Georgian Chamber Orchestra’ and Munich Chamber Orchestra, collaborating with conductors such as Lawrence Foster, Sir Colin Davis, Michail Jurowski, Jonathan Nott, Asher Fisch, José Serebrier, Christoph Poppen, Saulius Sondeckis, Theodor Guschlbauer, Andris Nelsons, Ari Rasilainen, Ira Levin, Nicholas Milton, Marc Piollet, Emil Tabakov, Victor Pablo Pérez, Osvaldo Ferreira, Fabio Mechetti, Benjamin Northey, Gabriel Feltz and Markus Poschner, among others. For the Bavarian Radio Station, the violinist has recorded various pieces like Ballade Sonata for solo violin No. 3 by Eugène Ysaÿe, Edvard Grieg’s Sonata in C minor, the Sonata by Maurice Ravel, Valse-Scherzo, Op. 34 and Melody, Op. 42/3 by Tchaikovsky, the Béla Bartók’s Solo Sonata, Antonio Bazzini’s Dance of the Goblins, Sibelius and the Second Violin Concerto of Karol Szymanowski. The CD recording released by Naxos and featuring the Russian and Slavonic Miniatures by Fritz Kreisler was twice selected as the Recording Of The Month in 2006 by both The Strad Magazine and in 2004 by Naxos in Germany. 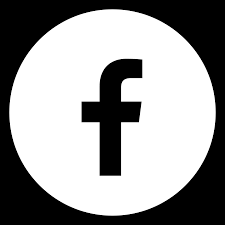 Nicolas teaches regularly and gives masterclasses in Germany and abroad. He is a teacher at the Vienna Conservatory. Chu Yibing is a Chinese cellist. He contributed to spreading ensemble music all over China. His ensemble China Philharmonic Cellists, made up of 12 Chinese cellists, gives concerts all over the country. He was imparted rudimentary knowledge of music by his parents, both of whom were professors in the Central Conservatory of Music in Beijing, when he was a kid. His mother is half-Swiss half-Chinese. 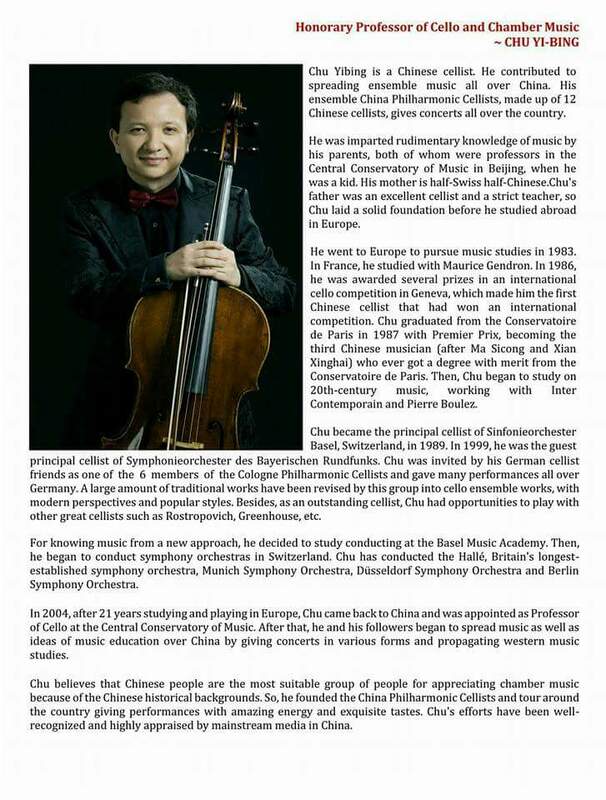 Chu’s father was an excellent cellist and a strict teacher, so Chu laid a solid foundation before he studied abroad in Europe. He went to Europe to pursue music studies in 1983. In France, he studied with Maurice Gendron. 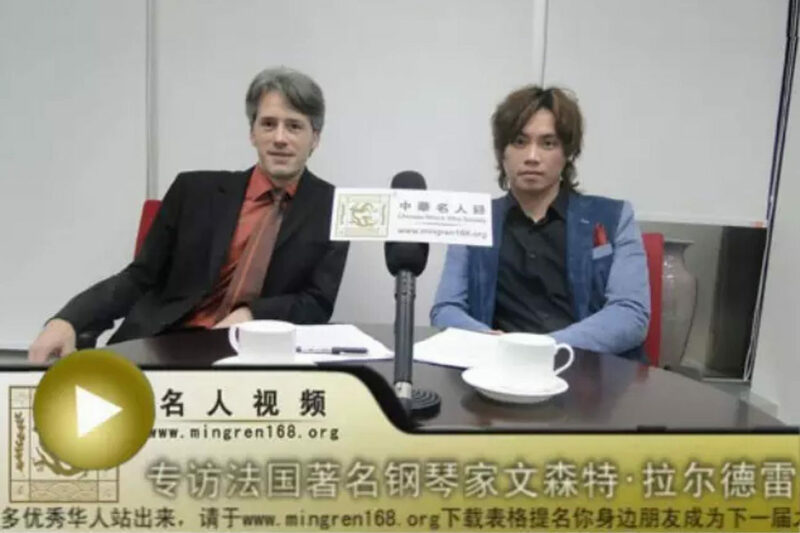 In 1986, he was awarded several prizes in an international cello competition in Geneva, which made him the first Chinese cellist that had won an international competition. Chu graduated from the Conservatoire de Paris in 1987 with Premier Prix, becoming the third Chinese musician (after Ma Sicong and Xian Xinghai) who ever got a degree with merit from the Conservatoire de Paris. Then, Chu began to study on 20th-century music, working with Inter Contemporain and Pierre Boulez. Chu became the principal cellist of Sinfonieorchester Basel, Switzerland, in 1989. In 1999, he was the guest principal cellist of Symphonieorchester des Bayerischen Rundfunks. Chu was invited by his German cellist friends as one of the 6 members of the Cologne Philharmonic Cellists and gave many performances all over Germany. A large amount of traditional works have been revised by this group into cello ensemble works, with modern perspectives and popular styles. Besides, as an outstanding cellist, Chu had opportunities to play with other great cellists such as Rostropovich, Greenhouse, etc. For knowing music from a new approach, he decided to study conducting at the Basel Music Academy. Then, he began to conduct symphony orchestras in Switzerland. Chu has conducted the Hallé, Britain’s longest-established symphony orchestra, Munich Symphony Orchestra, Düsseldorf Symphony Orchestra and Berlin Symphony Orchestra. 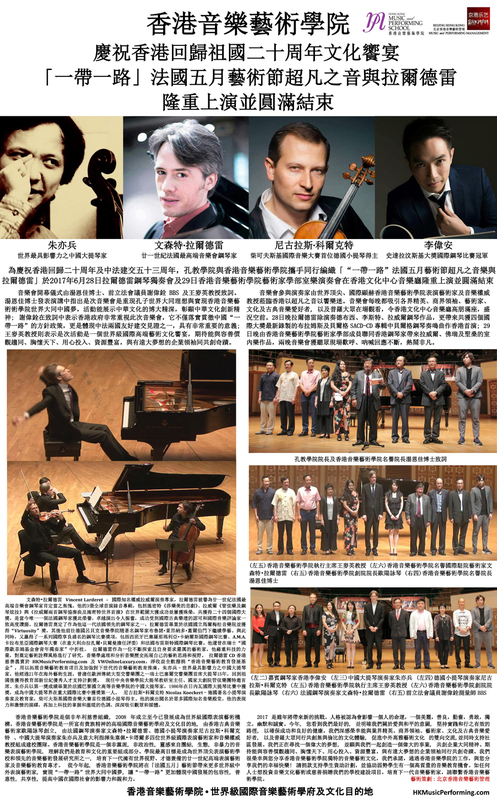 In 2004, after 21 years studying and playing in Europe, Chu came back to China and was appointed as Professor of Cello at the Central Conservatory of Music. After that, he and his followers began to spread music as well as ideas of music education over China by giving concerts in various forms and propagating western music studies. 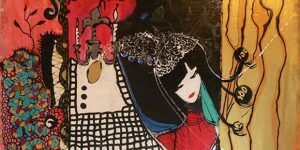 Chu believes that Chinese people are the most suitable group of people for appreciating chamber music because of the Chinese historical backgrounds. 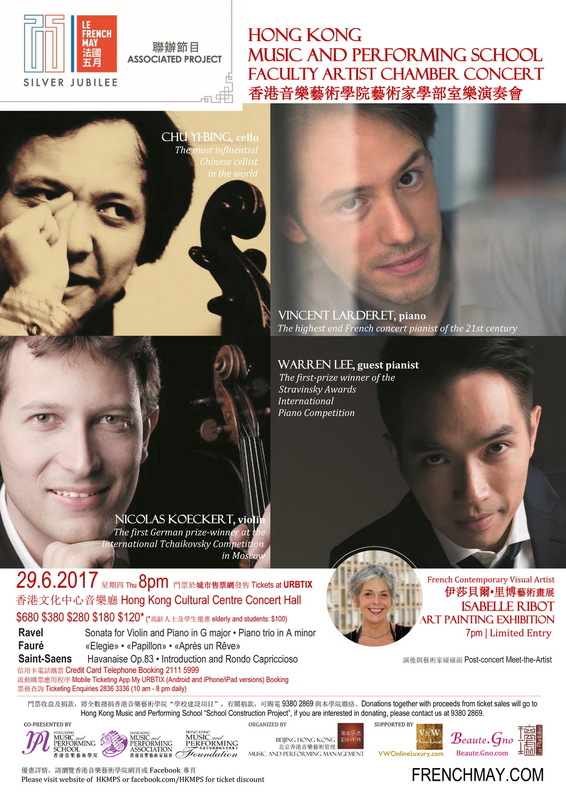 So, he founded the China Philharmonic Cellists and tour around the country giving performances with amazing energy and exquisite tastes. 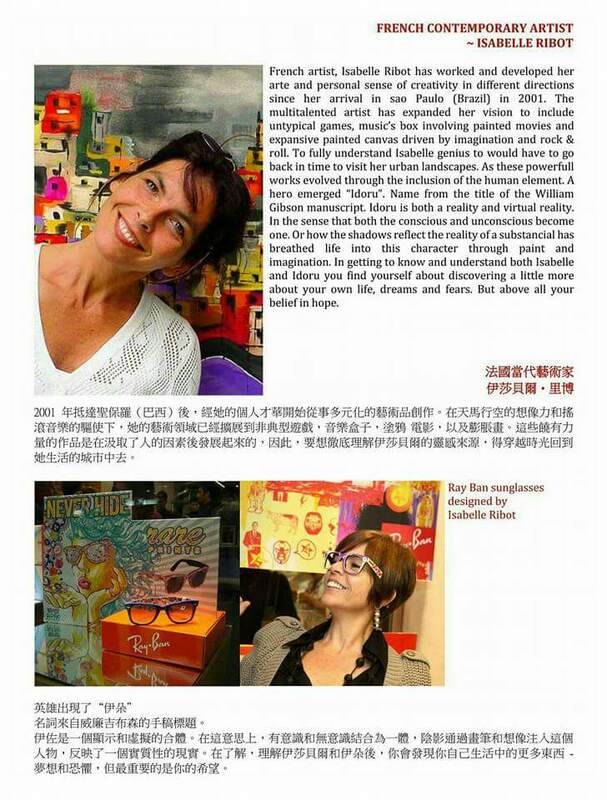 Chu’s efforts have been well-recognized and highly appraised by mainstream media in China. generation. 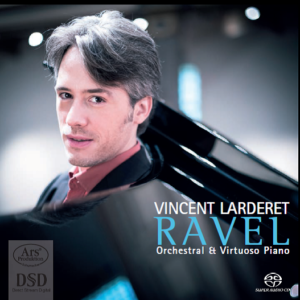 Piano Magazine in France declared : “Vincent Larderet compels a colorful, powerful and supremely mastered style. 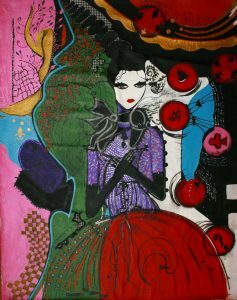 As Larderet aims for expression and touches the heart of music, the piano becomes distinguished, noble, and expressive”. 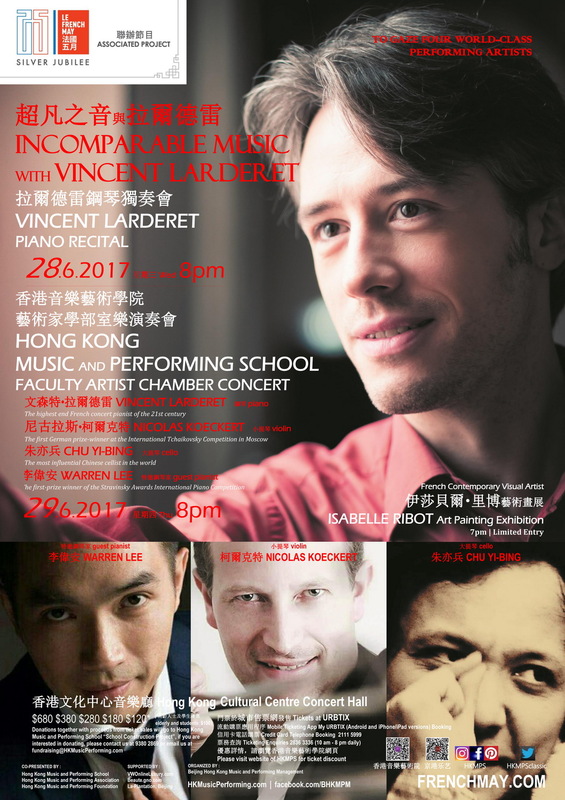 Vincent Larderet’s eclectic repertoire stretches from Scarlatti to Boulez, who played an important role in romantic period, French music and during the 20th century. He is also ardently favors lesser-known composers such as Scriabin, De Falla, Schmitt and Szymanowski. 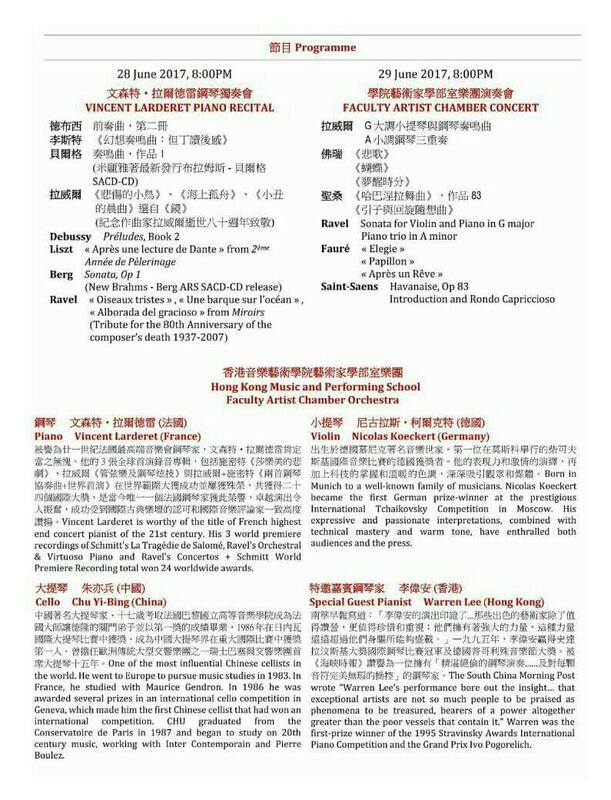 In 2007 he performed a series of recitals dedicated to Beethoven and especially distinguished himself with the Sonatas “Hammerklavier” Opus 106 and Opus 111. 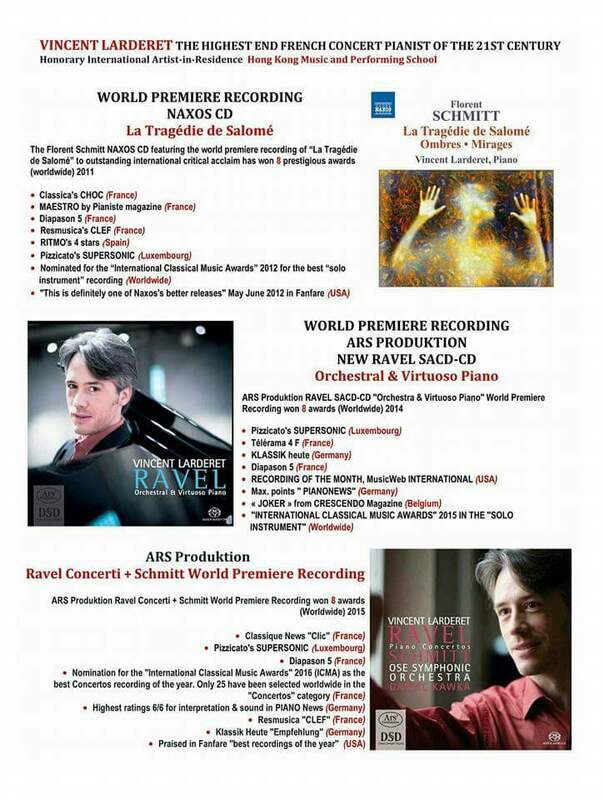 He also participated in the complete live recording of Beethoven’s Sonatas, notably alongside Stephen Kovacevich for the prestige DVD set released by Piano Passion. Internationally renowned as a Ravel specialist, he worked in Paris with Carlos Cebro who passed on to him the stylistic and musical tradition of Vlado Perlemuter and studied Ravel’s works on Perlemuter’s personal scores annotated after his collaboration with the composer. 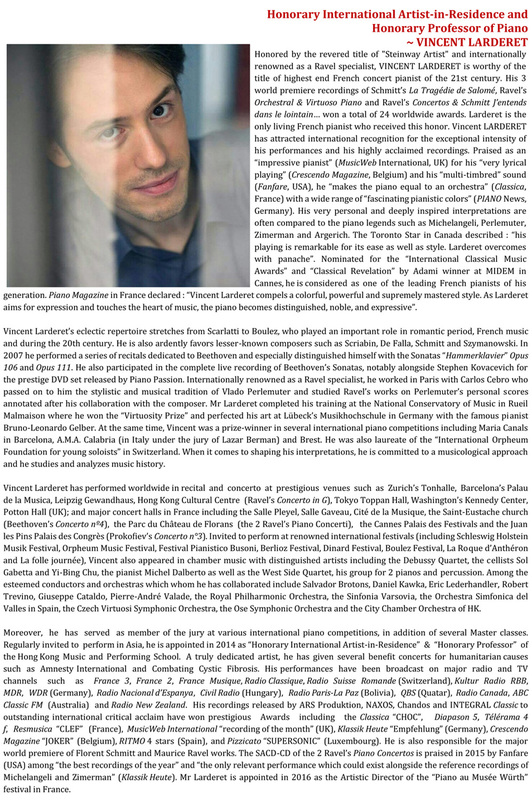 Mr Larderet completed his training at the National Conservatory of Music in Rueil Malmaison where he won the “Virtuosity Prize” and perfected his art at Lübeck’s Musikhochschule in Germany with the famous pianist Bruno-Leonardo Gelber. At the same time, Vincent was a prize-winner in several international piano competitions including Maria Canals in Barcelona, A.M.A. 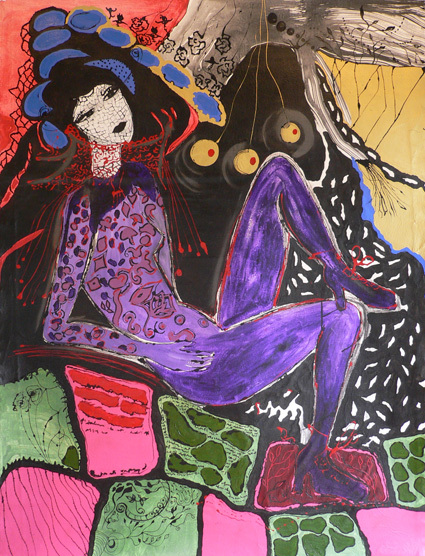 Calabria (in Italy under the jury of Lazar Berman) and Brest. 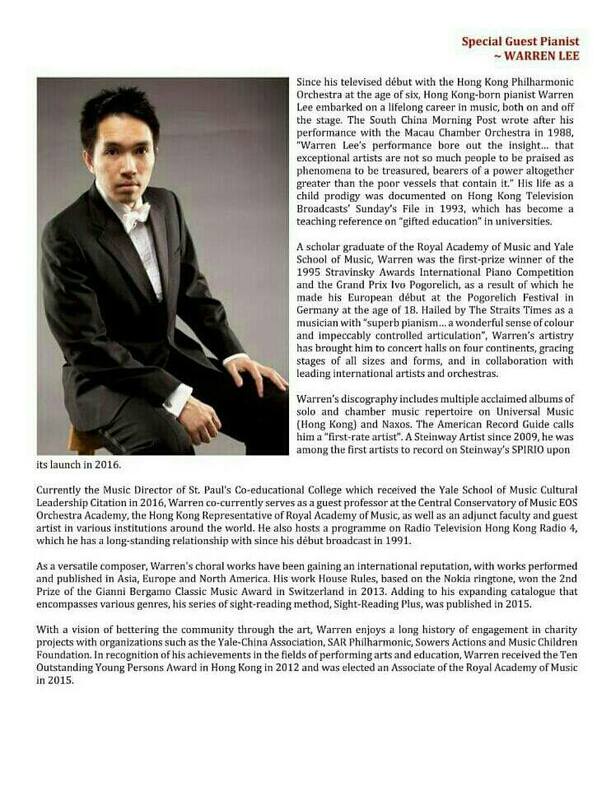 He was also laureate of the “International Orpheum Foundation for young soloists” in Switzerland. When it comes to shaping his interpretations, he is committed to a musicological approach and he studies and analyzes music history. 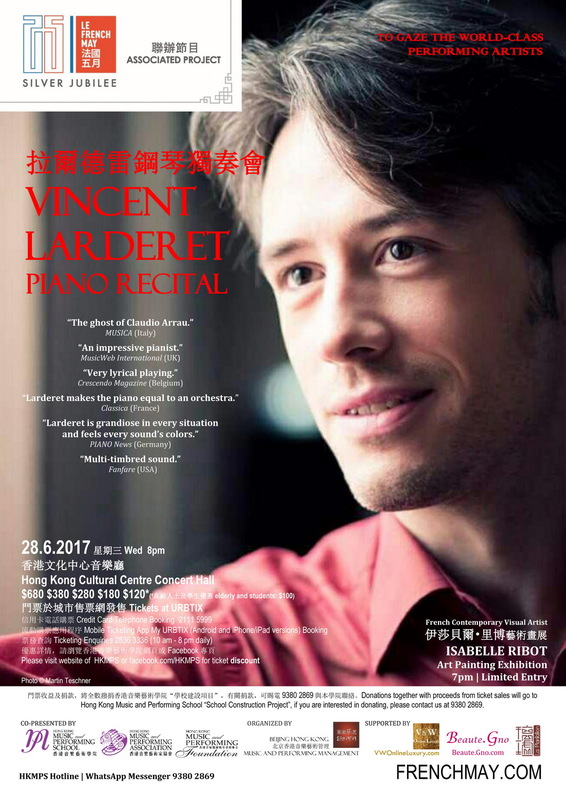 Vincent Larderet has performed worldwide in recital and concerto at prestigious venues such as Zurich’s Tonhalle, Barcelona’s Palau de la Musica, Leipzig Gewandhaus, Hong Kong Cultural Centre (Ravel’s Concerto in G), Tokyo Toppan Hall, Washington’s Kennedy Center, Potton Hall (UK); and major concert halls in France including the Salle Pleyel, Salle Gaveau, Cité de la Musique, the Saint-Eustache church (Beethoven’s Concerto nº4), the Parc du Château de Florans (the 2 Ravel’s Piano Concerti), the Cannes Palais des Festivals and the Juan les Pins Palais des Congrès (Prokoﬁev’s Concerto n°3). Invited to perform at renowned international festivals (including Schleswig Holstein Musik Festival, Orpheum Music Festival, Festival Pianistico Busoni, Berlioz Festival, Dinard Festival, Boulez Festival, La Roque d’Anthéron and La folle journée), Vincent also appeared in chamber music with distinguished artists including the Debussy Quartet, the cellists Sol Gabetta and Yi-Bing Chu, the pianist Michel Dalberto as well as the West Side Quartet, his group for 2 pianos and percussion. Among the esteemed conductors and orchestras which whom he has collaborated include Salvador Brotons, Daniel Kawka, Eric Lederhandler, Robert Trevino, Giuseppe Cataldo, Pierre-André Valade, the Royal Philharmonic Orchestra, the Sinfonia Varsovia, the Orchestra Simfonica del Valles in Spain, the Czech Virtuosi Symphonic Orchestra, the Ose Symphonic Orchestra and the City Chamber Orchestra of HK. 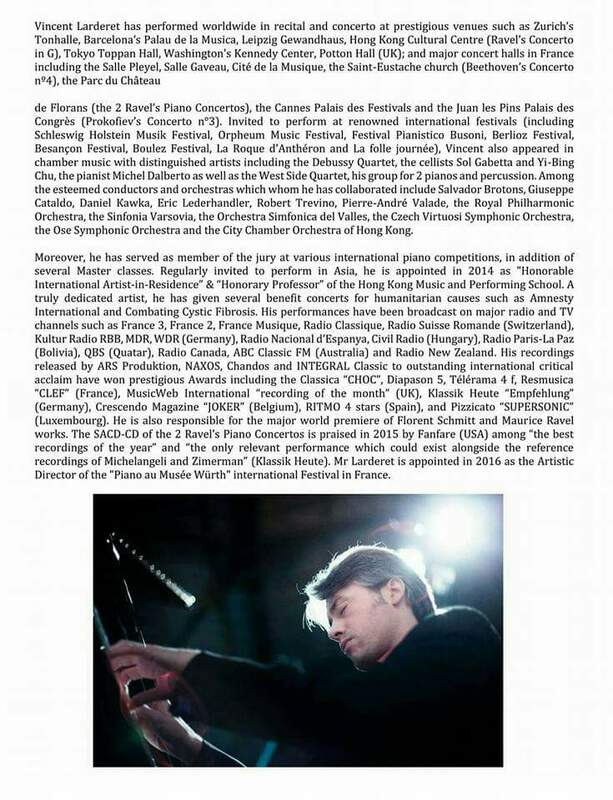 Moreover, he has served as member of the jury at various international piano competitions, in addition of several Master classes. 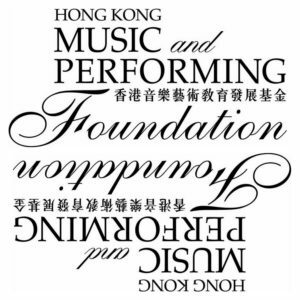 Regularly invited to perform in Asia, he is appointed in 2014 as “Honorary International Artist-in-Residence” & “Honorary Professor” of the Hong Kong Music and Performing School. A truly dedicated artist, he has given several beneﬁt concerts for humanitarian causes such as Amnesty International and Combating Cystic Fibrosis. His performances have been broadcast on major radio and TV channels such as France 3, France 2, France Musique, Radio Classique, Radio Suisse Romande (Switzerland), Kultur Radio RBB, MDR, WDR (Germany), Radio Nacional d’Espanya, Civil Radio (Hungary), Radio Paris-La Paz (Bolivia), QBS (Quatar), Radio Canada, ABC Classic FM (Australia) and Radio New Zealand. 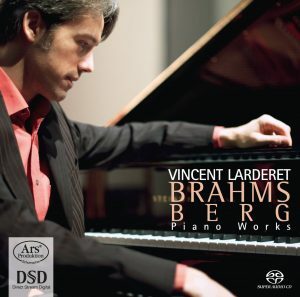 His recordings released by ARS Produktion, NAXOS, Chandos and INTEGRAL Classic to outstanding international critical acclaim have won prestigious Awards including the Classica “CHOC”, Diapason 5, Télérama 4 f, Resmusica “CLEF” (France), MusicWeb International “recording of the month” (UK), Klassik Heute “Empfehlung” (Germany), Crescendo Magazine “JOKER” (Belgium), RITMO 4 stars (Spain), and Pizzicato “SUPERSONIC” (Luxembourg). 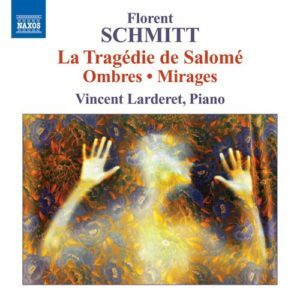 He is also responsible for the major world premiere of Florent Schmitt and Maurice Ravel works. 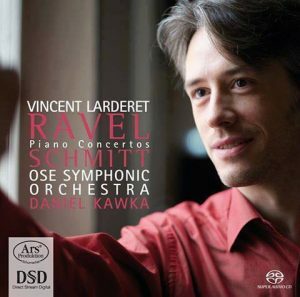 The SACD-CD of the 2 Ravel’s Piano Concertos is praised in 2015 by Fanfare (USA) among “the best recordings of the year” and “the only relevant performance which could exist alongside the reference recordings of Michelangeli and Zimerman” (Klassik Heute). 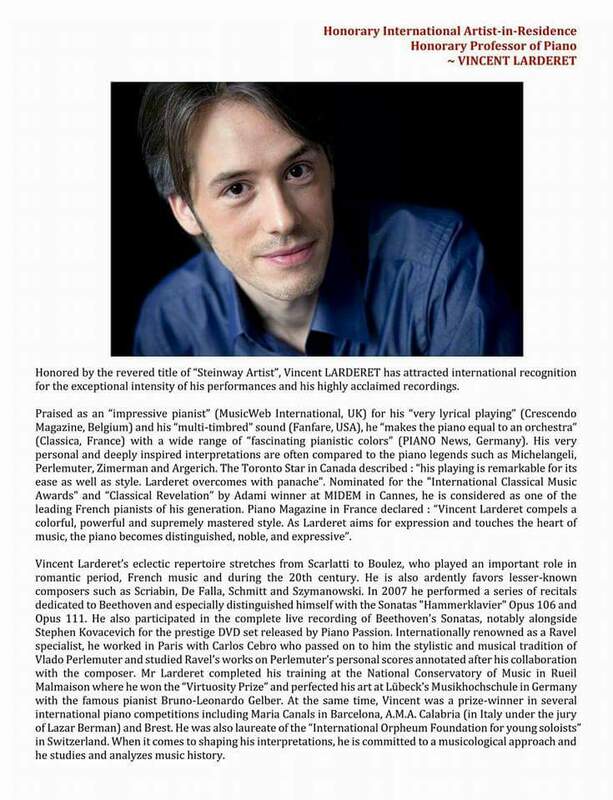 Mr Larderet is appointed in 2016 as the Artistic Director of the “Piano au Musée Würth” festival in France. 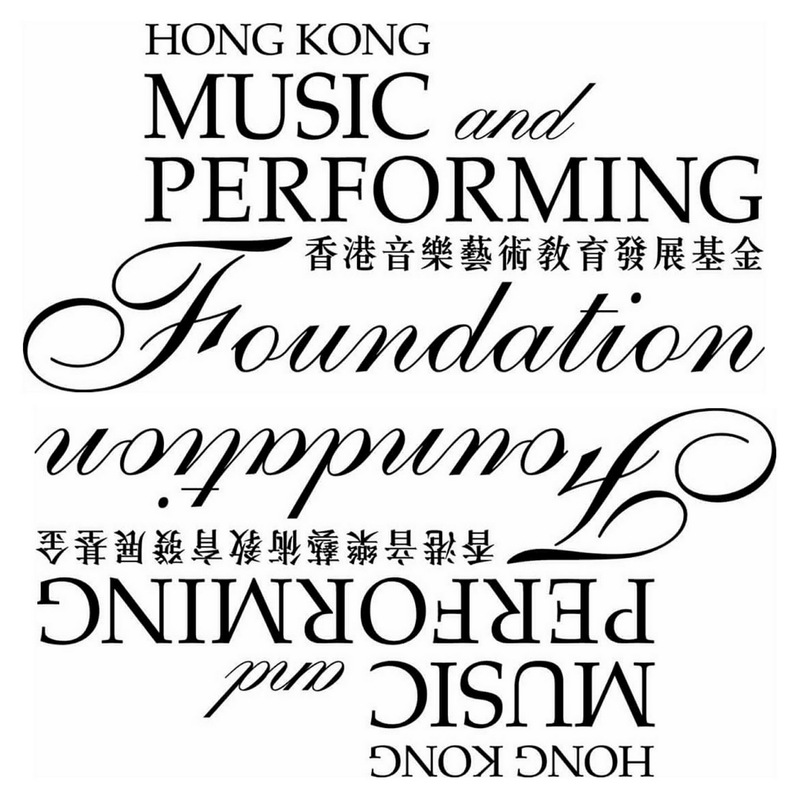 Please contact us if you want to invest in music art and culture or donate to our School Construction Project, nurturing the next generation of music artists. Engaging in classical music is sometimes regarded as a luxury. On the contrary, I believe that classical music makes our hearts richer: it touches souls and moves people in positive ways. Its value and its history throughout the world simply cannot be measured. I strongly feel that every individual should have access to this wonderful heritage and the possibility to meet classical music at some times in their lives. Classical music is also a universal language, one that goes beyond barriers. 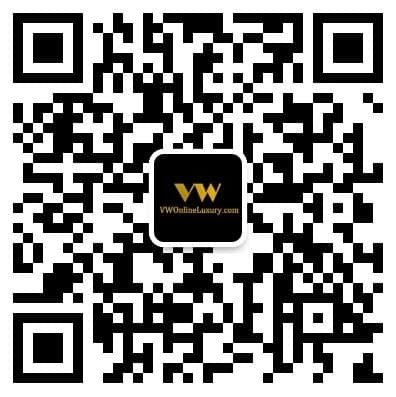 It’s a great channel for uniting all people and for creating world peace. 2014 is the year of the magical horse – the one that has supernatural powers, is heroic, strong, and can even fly! The horse years promises to bring us all good fortune and good luck. The year of the horse is also the year of HKMPS. 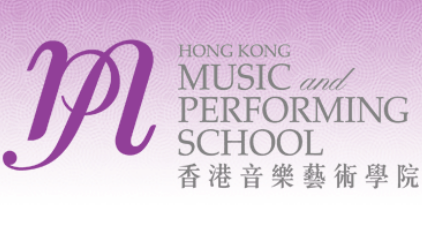 I hope that through the work of HKMPS I can share my good fortune and happiness with you all.